Kevin Hollinrake, MP for Thirsk and Malton, has praised an award-winning holiday park in the North York Moors National Park for its “tremendous contribution to tourism” in the region. 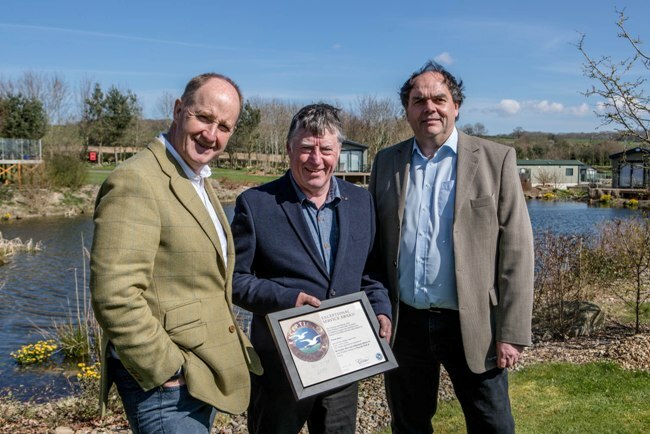 Mr Hollinrake visited the state-of-the-art 10-acre £500,000 Wayside Lakes lodges development at Wrelton, near Pickering, during English Tourism Week. While he was there, the MP presented Wayside’s park manager and co-director Trevor Jones with a long-service certificate. Trevor has worked on the park for 27 years. Mr Hollinrake said: “This is an excellent and very attractive development, which provides the perfect base to explore some of the most beautiful parts of Yorkshire. Owner Mark Goodson must be congratulated on his vision and commitment which have enabled the dream of Wayside Lakes to become a reality. “Our MP showed a genuine interest in what we are trying to achieve at Wayside. Given the constraints on his time at the moment, we were honoured that he took the trouble to come to see us. It was also fitting that he presented my colleague and friend Trevor Jones with a long-service certificate. “Trevor has worked here for 27 years, first for my father Roger, and now with me as my co-director. His hard work, enthusiasm, good humour and commitment to Wayside is exemplary – he is someone who always brings me solutions, not problems,” said Mr Goodson. Mr Goodson, whose family are steeped in the entertainment business and ran iconic cinemas in Filey, Tadcaster and Sleaford, explained that he is hoping this year will prove even more successful for Wayside Lakes than last. The five-star development, whose focal point is two picturesque lakes, caters for up to 38 exclusive lodges. Already 16 lodges have been bought and are occupied on site, with strong interest coming in for others from across the north of England. Prices start from £60,000, rising to £120,000. Mr Goodson commented: “2018 was a strong year for us. We sold four lodges, together with three static caravans, worth a total of nearly £400,000. This was despite the uncertainty of Brexit, the awful weather at the beginning of the season and the football World Cup, when everything stopped,” explained Mr Goodson. “This year Brexit may well encourage our key demographic, the grey pound, to holiday in the UK and there is no World Cup. We have three demonstration houses at Wayside Lakes and four new static caravans at the Holiday Park. We are already experiencing strong interest in both the Lakes and the Park. “Last year was also notable for the fact that we were short-listed for two prestigious awards, the York Press Family Business of the Year and the Ryedale Family Business of the Year. It was extremely gratifying for Wayside to gain such recognition in the county,” he said. “Most of our new owners are 50-plus, professional and white collar workers who are retired or semi-retired. They have decent pension pots and want a comfortable and attractive home, away from the bustling world, but close enough to beautiful countryside and sophisticated tourist attractions. They find our development fits this bill perfectly. Mark Goodson, though, has come relatively late to the holiday park world. Whilst he has always had an interest in the family business, he was a co-director of an IT business in Hull for 25 years, before semi retiring and joining his father at Wayside Park in 2011.